What Causes Achilles Tendinitis ? Achilles tendonitis is commonly seen in athletes who sustain an increase in training load, and is most often due to overuse. Tendons respond poorly to overuse, therefore healing is slow. This can leave a tendon pathologically defective, which decreases tendon strength and leaves it less able to tolerate load, thus vulnerable to further injury or tendinosis. Extrinsic factors contributing to this condition include training errors and inappropriate footwear. Intrinsic factors include inflexibility, weakness and malalignment. In other situations, there will be clinical inflammation, but objective pathologic evidence for cellular inflammation is lacking, and in these conditions the term tendinosis is more appropriate. Tendinosis is a degeneration of the tendon?s collagen in response to chronic overuse; when overuse is continued without giving the tendon time to heal and rest, such as with repetitive strain injury, tendinosis results. Even tiny movements, such as clicking a mouse, can cause tendinosis, when done repeatedly. Most common in middle-aged men. Conditions affecting the foot structure (such as fallen arches). Running on uneven, hilly ground, or in poor quality shoes. Diabetes. High blood pressure. Certain antibiotics. ?Weekend Warriors?. Recent increase in the intensity of an exercise program. While Achilles tendinitis can flare up with any overuse or strain of the Achilles tendon, it most often affects middle-aged men, especially if they are ?weekend warriors? who are relatively sedentary during the week, then decide to play basketball or football on Saturday. Those with flat feet or other structural conditions affecting their feet tend to put excess strain on the Achilles tendon, increasing their chances of developing Achilles tendinitis or even rupturing the tendon. If you are a runner, be sure to only run in quality running shoes that are supportive and well cushioned, and to be mindful of the surface you?re running on. Uneven surfaces and especially hilly terrain put additional strain on your Achilles tendon and can lead to the condition. There are several types of Achilles tendinitis symptoms, but all of them are closely related. People who suffer from Achilles tendon pain typically have swelling in the Achilles tendon, and that pain can be chronic as the microscopic tears in the area become more prevalent over time. 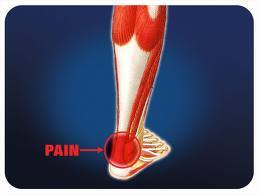 The most intense pain is typically located just a few centimeters above the area where the tendon meets the heel. This area is called the watershed zone, and the amount of blood moving through it is what gives it the highest potential for injury, especially for athletes. Most of the Achilles tendinitis symptoms in people with the condition will happen immediately after they have been inactive for a fairly significant amount of time. That means that the most pain will generally be felt after sitting or lying down for an extended period, or right after waking up in the morning and getting moving. If you aren?t positive that you are suffering specifically from Achilles tendinitis symptoms, consult a doctor to make sure. A doctor or professional therapist will confirm a diagnosis, identify and correct possible causes, apply treatment and prescribe eccentric rehabilitation exercises. An MRI or Ultrasound scan can determine the extent of the injury and indicate a precise diagnosis. Gait analysis along with a physical assessment will identify any possible biomechanical factors such as over pronation which may have contributed to the achilles tendonitis and training methods will be considered. Biomechanical problems can be corrected with the use of orthotic inserts and selection of correct footwear. NSAIDs help decrease swelling and pain or fever. This medicine is available with or without a doctor’s order. NSAIDs can cause stomach bleeding or kidney problems in certain people. If you take blood thinner medicine, always ask your healthcare provider if NSAIDs are safe for you. Always read the medicine label and follow directions. Steroid injections. Steroids decrease pain and swelling. After you get this shot, you may feel like your Achilles tendon is healed. Do not return to your regular exercise until your caregiver says it is okay. You could make the tendinitis worse, or even tear the tendon. Surgery. If your tendinitis does not heal with other treatments, you may need surgery. Surgery may be done to repair a tear in the tendon, or to remove parts of the tendon. The most important way to manage Achilles tendinitis is to rest. Rest decreases swelling and keeps your tendinitis from getting worse. You may feel pain when you begin to run or exercise. The pain usually goes away as your muscles warm up, but it may come back. Your caregiver may tell you to stop your usual training or exercise activities. He may give you other exercises to do until your Achilles tendon heals. Ice decreases swelling and pain. Put ice in a plastic bag. Cover it with a towel. Put this on your Achilles tendon for 15 to 20 minutes, 3 to 4 times each day. Do this for 2 to 3 days or until the pain goes away. After 2 or 3 days, you may use heat to decrease pain and stiffness. Use a hot water bottle, heating pad, whirlpool, or warm compress. To make a compress, soak a clean washcloth in warm water. Wring out the extra water and put it on your Achilles tendon 15 to 20 minutes, 3 to 4 times each day. Stretching and making the muscles stronger may help decrease stress on your Achilles tendon. Physical therapists can teach you exercises and treatments to help your tendinitis heal faster. You may need to wear inserts in your shoes. You may need to wrap tape around your heel and back of the leg. You may need to wear a cast, brace, or support boot. Following the MRI or ultrasound scan of the Achilles tendon the extent of the degenerative change would have been defined. The two main types of operation for Achilles tendinosis are either a stripping of the outer sheath (paratenon) and longitudinal incisions into the tendon (known as a debridement) or a major excision of large portions of the tendon, the defects thus created then being reconstructed using either allograft (donor tendon, such as Wright medical graft jacket) or more commonly using a flexor hallucis longus tendon transfer. In cases of Achilles tendonosis with more minor degrees of degenerative change the areas can be stimulated to repair itself by incising the tendon, in the line of the fibres, which stimulates an ingrowth of blood vessels and results in the healing response. With severe Achilles tendonosis, occasionally a large area of painful tendon needs to be excised which then produces a defect which requires filling. This is best done by transferring the flexor hallucis longus muscle belly and tendon, which lies adjacent to the Achilles tendon. This results in a composite/double tendon after the operation, with little deficit from the transferred tendon.